The basic idea of golf is really simple: get the ball in the hole. However, golf has many rules and regulations that takes a simple concept and turns it into an incredibly difficult and popular game. The game has been around for over five centuries and the game has been modified over time. In modern days, there are multiple golf courses that can be used and there are courses that consist of either 9 or 18 holes. The rules of the game are designed to be fair for all players, with the most known rule being play the ball where it lies, which simply means a player can't move the ball from where it landed. Clothing has even been designed to allow players freedom of movement during their game, and amongst some players it has become their fashion statement. 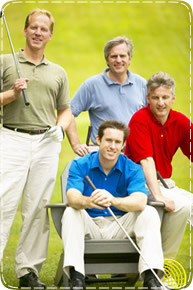 Golf is a popular sport today not only to play but to watch. Some golfers have become famous from playing world tours and have acquired promotional deals with companies that sell golf equipment such as shoe and clothing companies. The PGA and LPGA tours have television specials as well as sell tickets for spectators and fans to watch the game up close and personal.